For the sake of the fanboys out there, seen below is the Hyperion from Star Craft 2. Used to be the ride of that Mengsk guy until Jim Raynor jacked it for his own use. Anyway, seen below is just one among a selection of pics taken by Sven Junga, the passionate enthusiast who lovingly built the Hyperion via a dozen thousand bricks. He even went as far as to include a complement of ground forces. That miniscule Terran Marine just kills! 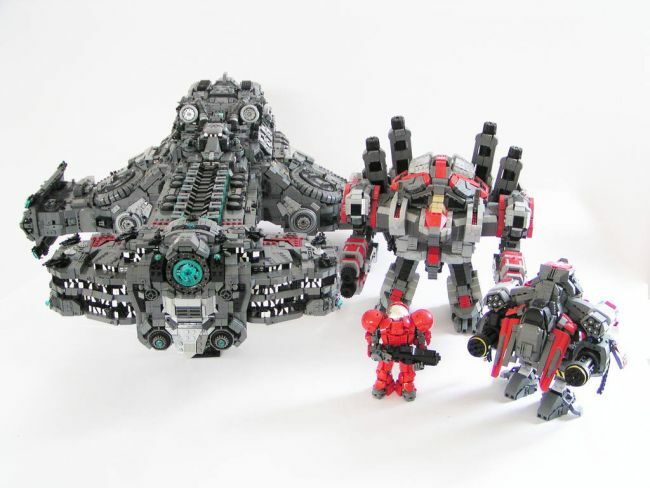 Exploring Junga’s Flickr account reveals an affinity for Lego renditions of Star Craft 2 units, mostly focused on Jim Raynor’s Terran forces. The Hyperion is the latest addition though and pictures of it were uploaded on Christmas Eve last year. For optimum photogrpahic results Junga used an Olympus C730UZ. He didn’t build these models overnight though. Based on the dates on his Flickr (don’t miss his previous work on sci fi vehicles and starships), it took months and months plus ample spare time to pull off each particular unit. Not surprisingly, the praise he has received so far is much deserved.